Parrot is one of those weird companies that are known for a diverse number of things that are made with one common technology: Bluetooth. Their AR.Drone is one of the slickest RC helicopters/mini-UAVs around and has delighted kids and adults with a beautiful control system that most use on a daily basis: their iPhones and Android phones. But do they have enough competence to design the best over ear headphones around? It seems with the helping hand of designer Philippe Starck, the Parrot Zik Headphones are certainly going for that prize as well as that of the best noise cancelling headphones around. With a host of features including complete control using a built-in touch sensitive panel over the right ear pad, an Audio Suite app for iOS and Android and a design to kill for, these are one of the premier headphones to see around. NFC compatibility and a removable and replaceable Li-Ion battery allow these headphones to command the obscene price tag. Audio quality is quite outstanding and worthy of the price. The highs, mids and lows are very well sculpted with the internal DSP processing it well even over the wireless. However, there are a few software glitches over the wireless streaming which will get better as software updates continue to arrive for the headphones. 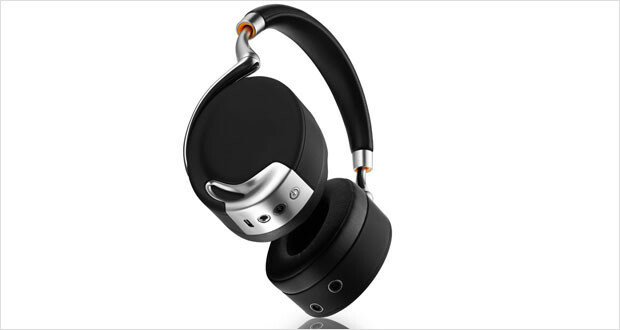 The look and feel of the Parrot Zik Headphones certainly complements the price tag. With metallic finishes, a swiveling armature, touch sensitive control pads and overall comfortable fit make these exceptionally good headphones to look, feel and use. Dimensions14.4 x 10.2 x 8.7"
The entirety of the headphones is made for a premium listening experience. The metal backbone along with the swiveling armature allows these headphones to feel as if they would not be broken by a minor fall. There is very little creaking or loose fit, and they do look exceptionally well-made. The luxurious padding along with a perfectly tight fit ensures that you will listen to your songs for quite a while before tiring from these. The highs are chirpy and well processed, with very little harsh overtones. Well grained and enveloped mids make vocals sound rather good. Electronic music aficionados would prefer a little more depth, but these ‘phones still offer great and deep bass. The ANC works quite well, blocking out a good chunk of the external noise when turned on without any appreciable difference in the sound quality. There are some basic glitches and drops while streaming audio via Bluetooth, but the headphones perform admirably well otherwise. The sound quality is decent, well balanced and quite punchy when required. The ANC is excellent and one of the better ones we have tested. The design is comfortable, durable and looks sharp. The Bluetooth streaming works well and will only get better. The only thing that really makes you hesitate is the almost $400 price tag. Sure these are great, but are they good enough to command that price, especially when it’s yet another gadget you need to charge every day? That is up to you, reader!